The update might not look like much on the outside, but it's what's on the inside that counts. It may be the ugliest Porsche ever. 2018 vs. 2019 Porsche Cayenne: What's the Difference? The 2019 update for the Cayenne might not be noticeable at first glance, but there are a lot of updates under the skin. 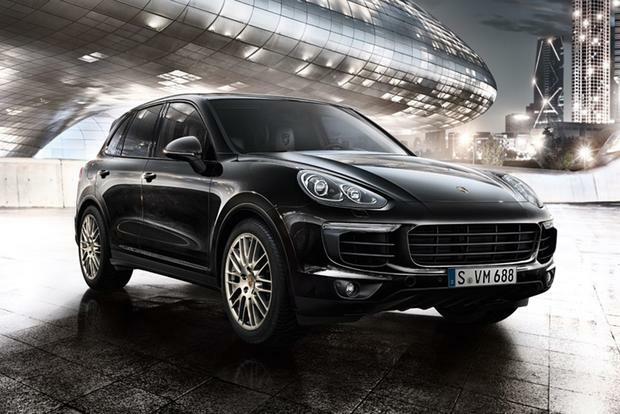 The 2017 Porsche Cayenne offers luxury, performance and a legendary pedigree in a highly stylized five-passenger crossover SUV. As one of the first of its kind, the Cayenne still sets the standard for a large pack of competitors that include the BMW X5, Land Rover Range Rover Sport and Audi SQ5. An impressive 8-trim lineup for 2017 is punctuated by three engine choices, including a hybrid option. While each model offers varying trim treatments, the most significant difference lies under the hood. Performance clearly gets preference here, with even the base V6 model pumping out a respectable 300 horsepower. Impressive power and handling; high-quality interiors; fuel-efficient plug-in hybrid option; sports-car performance in an SUV. Extensive options list quickly escalates already elevated base price; offers practical but not as voluminous options as other SUVs; punishing fuel economy in high-powered gas versions. All Cayenne models offer potent levels of performance compared to competitors, and their brawn is proportionate to their prices. An 8-speed Tiptronic automatic is standard on all models, as is a sophisticated all-wheel-drive system. 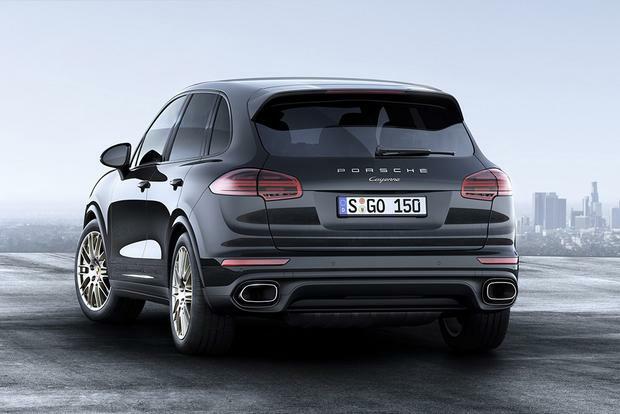 The base Cayenne features a 300-hp 3.6-liter V6 with 295 lb-ft of torque. The Environmental Protection Agency (EPA) estimates for this model are 19 miles per gallon in the city and 24 mpg on the highway. 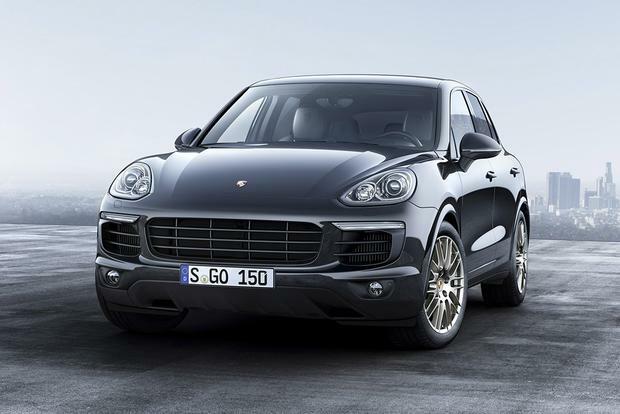 The Cayenne S features a twin-turbocharged 3.6-liter V6, good for 420 hp and 406 lb-ft of torque. EPA estimates for the S are 17 mpg city/24 mpg hwy. The Cayenne S E-Hybrid's 416 hp helps it hit 60 miles per hour in 5.4 seconds, although it's the 435 lb-ft of torque that creates the satisfying, seat-squishing sensation when the right pedal is buried. Expect 22 mpg combined and 47 mpg equivalent in hybrid electric mode. The GTS uses the same 3.6-liter twin-turbocharged engine found in the S but bumps output to 440 hp and 443 lb-ft of torque. EPA estimates are 16 mpg city/23 mpg hwy. The Turbo model's twin-turbocharged 4.8-liter V8 elevates hp to 520 and 553 lb-ft of torque, with fuel economy estimates of 14 mpg city/21 mpg hwy. The Turbo S uses this same engine only, with output at 570 hp and 590 lb-ft of torque. EPA estimates for the Turbo S are identical to the Turbo at 14 mpg city/21 mpg hwy. Porsche offers the Cayenne in eight trims: Cayenne, Cayenne Platinum Edition, S, GTS, S E-Hybrid, S E-Hybrid Platinum Edition, Turbo and Turbo S.
The Cayenne ($60,650) comes with active all-wheel drive, an 8-speed Tiptronic automatic transmission, 18-in wheels, bi-xenon headlights, rain-sensing wipers with heated washer nozzles, heated side mirrors, dual-zone automatic climate control, a power rear lift gate, 10-speaker PCM audio with a 7-in touchscreen display, Bluetooth, fog lights, leather seating surfaces, 8-way power front seats and a refrigerated glove box. The Cayenne Platinum Edition ($66,650) adds 20-in RS Spyder style wheels, 8-way leather sport seats with Alcantara inserts and unique interior and exterior trim and badges. The Cayenne S ($77,250) has a more powerful engine, plus 19-in wheels, a power sunroof and front and rear parking assist. The Cayenne S E-Hybrid ($79,750) adds speed-sensitive power steering, Porsche Car Connect with a smartphone app, an adaptive suspension, an onboard charger and a hybrid readout display screen. The Cayenne S E-Hybrid Platinum Edition ($82,650) adds the same features as the S Platinum Edition. 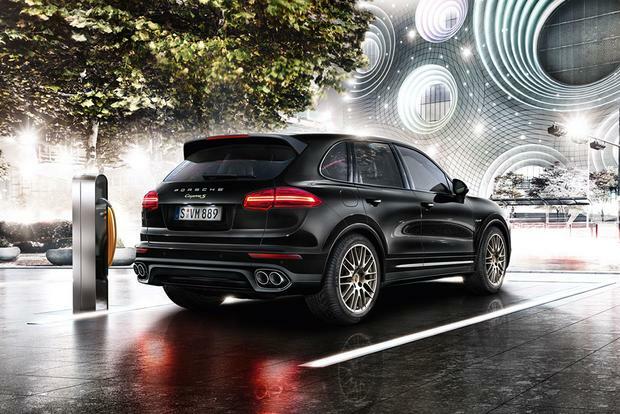 The Cayenne GTS ($98,250) gains a pneumatic air suspension, 20-in wheels, an upgraded suede and leather interior, performance brakes, an adjustable sport exhaust and 14-way power front seats. 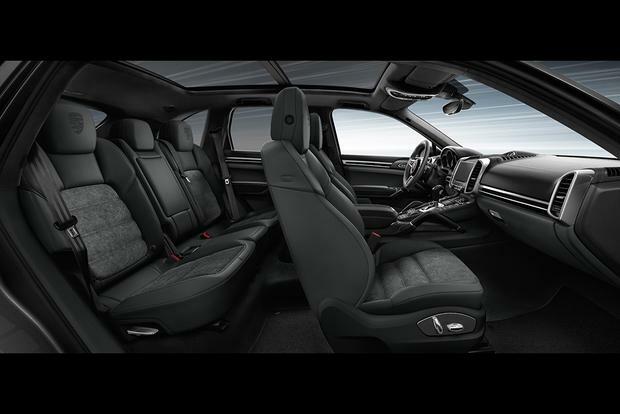 The Cayenne Turbo ($117,550) features 14-way power front seats, LED headlights, an air suspension, 14-speaker Bose surround-sound audio, a heated and power adjustable steering wheel, heated rear seats and 19-in wheels. 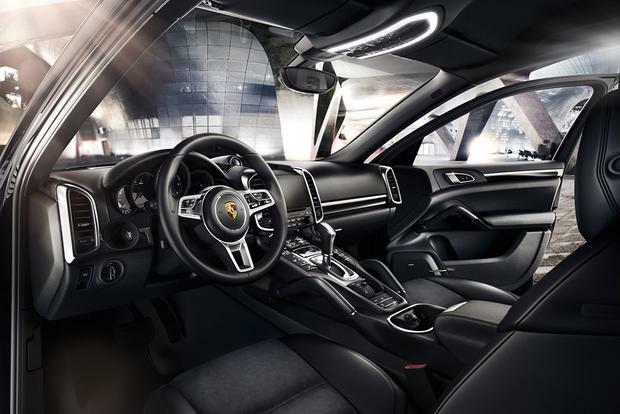 The Cayenne Turbo S ($160,650) adds such performance enhancements as Porsche Dynamic Chassis Control (PDCC), carbon-ceramic brakes and the Sport Chrono package. Porsche has endowed the Cayenne with virtually every technological goodie available, but those creature comforts come at a price. For example, a Bose surround sound system adds $1,690, while a 1,000-watt Burmester setup runs $5,690; Porsche Car Connect costs $540, while a satellite-radio receiver requires $750; and expect to pay $2,890 for a rear-seat entertainment system. When it comes to driving aids, the Cayenne can be ordered with adaptive cruise control, lane-change assist, an active air suspension and PDCC. Ceramic brakes add nearly $9,000 to the sticker price. With the rear seats folded, the Cayenne offers 62.9 cu ft. of rear-storage volume, which is less expansive than some models in this segment, but then again, this SUV is more about the S than the U.
Porsche's Cayenne boasts crash-safety engineering that includes a chassis strategically reinforced with high-tensile steel, force limiters on the front seats and rollover detection that triggers seat-belt pretensioners and curtain airbags. Additional airbags are in front, passenger and driver's-knee locations. High-strength crossmembers protect the doors and bumpers. Neither the government nor the independent Insurance Institute for Highway Safety has crash-tested the Porsche Cayenne. Performance varies dramatically from model to model, but the entire 2017 Porsche Cayenne lineup boasts genre-defying performance capabilities. The S E-Hybrid's copious torque makes it the surprise performer of the bunch, especially when the shifter is clicked into S, sharpening throttle response and putting the transmission into a more aggressive mode of attack. The S E-Hybrid can also drive on electric-only mode at speeds up to 78 mph. The GTS version ups the ante, but for truly awe-inspiring performance, the Turbo and Turbo S are the models of choice. Start/stop technology makes for serene red-light experiences, but Sport mode in this SUV transforms it into an aggressive, lurching beast. Similarly, the suspension can transform from floaty to stiff with the touch of a button, and its most aggressive handling modes make it so quick to turn that it becomes easy to forget you're in a hulking animal of an SUV. 2017 BMW X5 -- BMW's X5 trims range from the xDrive35i's turbocharged 6-cylinder to the X5 M's 4.4-liter turbocharged V8 that churns 567 hp. BMW's X5 offerings are more philosophically in line with Porsche's driver-focused Cayenne models than Audi's. 2017 Land Rover Range Rover Sport -- The Range Rover offers luxury and attention to design detail comparable to the Porsche, but its considerably higher curb weight keeps it from competing head-to-head against Porsche in performance. 2017 Jeep Grand Cherokee SRT -- The Grand Cherokee SRT may not have the same level of luxury or panache as the Cayenne, but with 475 hp under its hood and a sub $70,000 price tag, it's certainly worth a test drive. Used Porsche Cayenne Turbo S -- A 2011-2015 Porsche Cayenne Turbo S will give all the performance and features of a new Turbo, but due to its lackluster resale value, it will cost a lot less.